Japan's economy is the third largest in the world, after the U.S. and Chinese economies, with a nominal gross domestic product of about $4.21 trillion in 2015. But the country's status as the world's largest creditor, rather than its economic prowess, has given its currency—the Japanese yen—a safe-haven reputation in the marketplace. As a result, the Japanese yen has become the third most traded currency in the foreign exchange market after the U.S. dollar and the euro. During the eurozone's sovereign debt crisis, the Japanese yen appreciated significantly in value as one of the few safe-haven currencies, particularly after the Swiss franc was pegged to the euro's valuation to prevent further appreciation. The Japanese yen has also been a popular carry trade in the past, due to the low interest rates that made it cheap to borrow. While the currency lost some of this clout in 2015 and 2016, the currency plays a vital role in the lives of many international investors. The Japanese yen has a safe-haven status, and traders use the currency for capital gains opportunities and hedging purposes. The Japanese yen has been historically popular among international investors as a safe haven, carry trade, and currency hedge. Since the early 2000s, investors had begun borrowing Japanese yen given the Bank of Japan's very low interest rates. The funds from these borrowings were then lent out in other currencies, like the U.S. dollar, at a higher interest rate. By 2007, some estimates pegged the Japanese yen carry trade at around US$1 trillion in size, before unwinding. Between 2008 and 2012, the Japanese yen became a desirable safe-haven investment for international currency traders, given the country's creditor status. These activities drove up the yen's valuation versus other currencies and hurt its export sector considerably. In 2013, Prime Minister Shinzo Abe was elected on the promise to reduce the Japanese yen's valuation through quantitative easing and other measures, which helped bring down the valuation. Throughout all of these periods, the Japanese yen was also used as a currency hedge, given Japan's status as an investment destination. U.S.-based international investors could offset the currency effects, gains or losses, in the volatile Japanese yen by purchasing long or short Japanese yen funds or buying directly in the spot foreign exchange market. The easiest way for international investors to gain exposure to the Japanese yen is using exchange-traded funds (ETFs). Employing a variety of derivatives like currency swaps, these funds attempt to mimic the price of the Japanese yen versus either the U.S. dollar or a basket of international currencies. 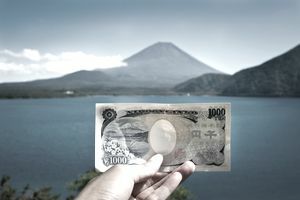 Some funds also offer leveraged or short-selling options that enable investors to capitalize on the Japanese yen's movement in a variety of ways. ProShares UltraShort Yen (YCS). YCS seeks daily investment results that correspond to two times the inverse (-2x) of the daily performance of the U.S. dollar price of yen, with a 0.95 percent expense ratio and approximately $425 million in total assets, as of March 2013. CurrencyShares Japanese Yen Trust (FXY). FXY is designed to track the price of the Japanese yen by holding Japanese yen in deposit with the share price reflecting the price in U.S. dollars of the Japanese yen, with a 0.40 percent expense ratio and approximately $215 million in total assets, as of March 2013. The spot foreign exchange (forex) market offers another option for traders looking to buy or sell Japanese yen. By using one currency to buy another currency in a highly leveraged (e.g., 50:1 or more) situation, traders can realize a profit when the currency purchased increases in value relative to the currency used to make the purchase. The Japanese yen is most commonly traded against the U.S. dollar in a currency pair known as USD/JPY. But before trading in these markets, international investors should be aware that the leverage involved often means greater risk. These trades are also typically placed in specialized forex broker accounts that may differ from existing stock brokerage accounts. You can speculate on the yen's activity by purchasing futures, which have a set expiration and fixed strike price, or you can take advantage of leverage and buy or sell options on yen futures contracts. Yen futures trade on the Chicago Mercantile Exchange (the Merc). You can also work with an experienced futures dealer and a managed futures account; futures also involve a significant degree of leverage and could wind up putting you in a large loss position quickly. If you are at all unsure of what you are doing, invest with a professional who knows the market. If you don't want to buy an ETF or hold the actual currency, you can benefit from movements in the yen indirectly by purchasing stocks or bonds in Japanese-owned companies. As the yen appreciates against the U.S. dollar, it often gives Japanese stock prices a boost. Consider buying stock in companies such as Nissan, Toyota, Matsushita, or Mitsubishi. If you prefer debt instruments, invest in Japanese government bonds, with prices that will reflect the condition of Japan's economy in terms of inflation, GDP growth, and interest rates, to name a few factors. The Japanese yen has been historically popular among international investors as a safe haven, carry trade, and currency hedge. The easiest way for international investors to gain exposure to the Japanese yen is using Japanese currency ETFs. The spot forex market offers another option, but it's a bit riskier than other using ETFs. How Does a Currency Intervention Work? What Are the Causes of — and Solutions to — a Currency Crisis?